Home » Are You Visible In Your Community? For the December 2, 2018 Growth Teleconference, Master George Broyles has scheduled Sa Bom Nim Joshua Duncan to share his strategies and techniques for generating word-of-mouth advertising for your school through community involvement. He has a long history of successful involvement with multiple Recreation Center style programs and suggests that creating and sustaining ongoing visibility of your school in your community and creating public recognition of the school owner as an expert are keystones to reaping the powerful growth opportunities both can provide for your school. Joshua Duncan Sa Bom Nim began his training in 1984 at Lomita Park Tang Soo Do under the instruction of Jerry Nyhus Kyo Sa Nim (E Dan at the time). His tang soo do training began as an activity outlet for a ten year old and his step-father also joined to strengthen their relationship. Upon return from a short break from training as a Green Belt due to school, John Huff Sa Bom Nim (then a newly promoted Sam Dan) had taken over leadership of the program. He continued his training and earned his Cho Dan in 1990. In 1996 Huff Sa Bom Nim retired and relocated to Virginia and Duncan Sa Bom Nim assumed leadership of the school as an E Dan. 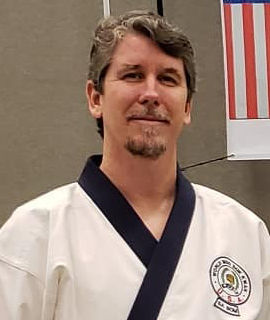 After taking over Lomita Park Tang Soo Do (renamed to Lomita Park Soo Bahk Do in 1995) Duncan Sa Bom Nim focused on expanding the program beyond 2 classes a week. The freedom of being fresh out of school and having no set career allowed him to expand the classes to 3 days a week and grow to 8 classes which included several levels of training; children, beginners, advances and Dan training. With this expansion and being part of a park program run by the city, he nurtured a close relationship with the city council, park directors and local community event organizers. By doing this Lomita Park Soo Bahk Do became widely recognized in the community and supported by city leaders. This support and recognition within his community created an opportunity to start a new Soo Bahk Do program in another city as one of the Lomita park directors relocated and saw a need for a martial arts program in his new city. He contacted Duncan Sa Bom Nim and asked him to open a second location there. This program was launched and run following the same idea of community support to gain visibility and recognition. Be sure to save the time slot to dial in for his Growth Teleconference presentation on Sunday evening Dec 2, 2018.